Papaya King Is Following Katz’s to Downtown BrooklynBringing tropical drinks and hot dogs to Flatbush Avenue this December. Bud Light Amps Up The Alcohol; Vegas Envies Our FukuburgerBe prepared to pass new Bud Light Platinum on the shelves as you reach for your Deschutes and Ballast Point. A Look into Papaya King, Now Transplanted Onto Hollywood Blvd.Though it looks like a faithful recreation of the original, this is actually Sam Nazarian’s franchised version of the isolated NYC legend. Doggone: Gray’s Papaya Closes Hell’s Kitchen LocationAnother area institution has disappeared. Papaya King Going HollywoodNazarian is a fairly flashy owner for such an everyday spot, making us cringe that this could be another import that doesn’t quite live up to the original. Gray’s Papaya Unleashes 50-Cent DogsFor an unlimited time! 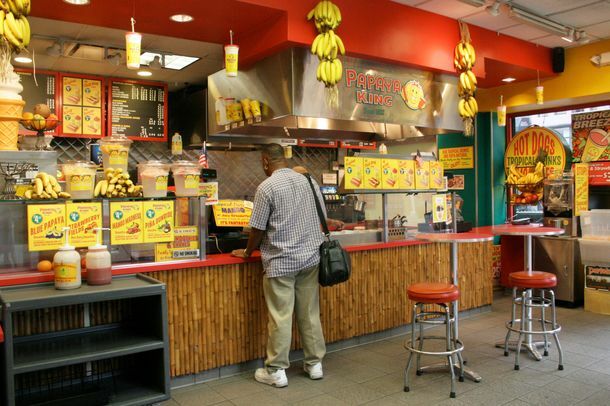 Papaya King Gets Naturally Revitalized, Reopens on Upper East SideTime to go bananas! Create Your Own Papaya DogPlus, the latest on the Upper East Side store’s reopening. Shack Sneak Attack: Shake Shack Upper East Side Is Now Open!Outdoor seating and new concretes! Yay! New Owners Plan ‘Whole New Papaya King’The brand’s new 34-year-old operator. Papaya King Closes After 78 Years, Assures Mid-Summer ReturnWill the Upper East Side store face the fate of its shuttered 14th Street location? Papaya Purge: The King Is Buried on West 14thThe Papaya King on 14th Street meets its end via bagel store. Bagels Will Replace Hot Dogs on Former Papaya King CornerCorner real estate is still very expensive. Papaya Purge: The King Is Vanquished on 14th StreetAnother Papaya gone. Another Papaya Dog Goes to HeavenAnother Papaya King knockoff has bit the dust. Bummer Indeed: Gray’s Papaya Finally Raises PricesWhen Gray’s Papaya announced in September that the price of its Al Franken–endorsed frank was to go up from 95 cents, founder Nicholas A. B. Gray was keeping mum about the math. We visited the Sixth Avenue location this weekend and can now report that as of the beginning of the month, the price is $1.25. This exceeds even the 25-cent jump (from 50 cents to 75 cents) of 1999. Still more devastating, the Recession Special — two dogs and a small drink — has gone from $2.75 to $3.50. Not that we would forsake Gray’s for an inferior imitator, but when we called every other listed Papaya stand in the city, we made an all-too-sobering discovery: These days you’ll have to go out to Queens to get a 95-cent frank. Here’s how much fourteen different dogs will set you back.